Land Rover Multi-tool: If you're a Land Rover fan, this Land Rover Multi-tool - its shape is based on the iconic Land Rover Defender - features 11 useful tools in one to give you a compact accessory that fits easily in the pocket. Monumental Monster: Big Brutus has been placed on the National Register of Historic Places. Billed as the largest electric shovel in the world today, big doesn't begin to describe Brutus. On the flats of southeastern Kansas it stands out for miles. The Bucyrus-Erie electric dragline shovel "was built in 1962 (at a cost of $6.5 million, or about $51.6 million in today's dollars) for the Pittsburg & Midway Coal Mining Company's strip-mining operation in West Mineral, Kansas. What it lacked in speed  it topped out at .22 miles per hour  it made up for in volume: A single scoop from its bucket could fill three railroad cars with 90 cubic yards, or about 150 tons, of material. Three-man crews worked Big Brutus day and night all year round." Bucyrus, now owned by Caterpillar, still makes surface mining equipment used for mining coal, copper, iron ore, oil sands and other minerals. Vintage & Well-Made: In my toolbox, I keep a big Craftsman screwdriver for big jobs. I bought it in the late 1960s and it's now a bit worse for the wear. In the early 1980s, I purchased a backup which I keep in my other toolbox. It's a Fuller 307, easily identifiable to tool aficionados by its characteristic transparent yellow molded acetate plastic handle with red top. The 307 model is slotted (aka: standard or flat blade) and has a 7-inch shaft length. Overall length is just over 11 inches. The shaft is hardened chrome-vanadium steel and still retains its original shine. The red top is a little beat up from being hammered - I sometimes use my big screwdrivers as a chisel, even though I have a perfectly good chisel somewhere. I can never find it when I need it. Or, more properly, don't take the time to find the chisel when I need it, especially if one of my big screwdrivers is handy and I'm feeling lazy. Connoisseurs of fine tools are horrified, I'm sure. Tool Archeology: My father-in-law owned a large wood-handled flat-blade screwdriver, a Yankee No. 90, made by North Brothers Manufacturing Company, a Philadelphia manufacturer of hand tools. This No. 90 has a blade width is 5/16 inches, shaft length is 5 inches and the overall length is 10.6 inches. North Bros. was an American manufacturer based in Philadelphia, Pennsylvania that specialized in the making of hand tools, small appliances and some specialized power tools. They were family-owned and operated for over 60 years before being acquired by the Stanley Works in 1946. They are best known for their line of tools, particularly the Yankee brand of ratcheting screwdrivers, also known as push-drivers. Founded in 1878, the company was originally only a foundry operation solely owned by Selden Gladwin North. North Bros. key acquisition was the hiring of Zachary Furbish when it purchased the Forest City Screwdriver Co. in 1897. As the 20th century progressed they began to focus on hand tools and eventually become a sizeable player in the hand tool industry. North Brothers was located at Lehigh Avenue and American Street, in the Kensington section of Philadelphia. In 1916, the firm employed 414 people. Whither Craftsman? Nobody's perfect. That's why I have a mix of tools in my collection. Some used to belong to my dad (most of those are pre-1960 and not name-brand items), some from my late machinist father-in-law (many are premium-grade tools, some have been modified/created by him) and my own stuff. I bought cheapie tools when I was in college (my 9¢ screwdriver is an example) and, in the early years of my marriage - due to other financial priorities. Beginning in the 1980s, I began purchasing a better grade of hand tools and power tools. Most of the hand tools (screwdrivers, wrenches, etc.) were Sears Craftsman brand - made in the USA. We used lots of Craftsman products in the rolling toolboxes at my plastics business - because they were dependable and Craftsman offered good value for the money in those days. In the 1980s, almost everything branded Craftsman was made in the United States. And well-made, too. In recent years, Sears has outsourced to China, in search of lower prices. And, it's no secret to tool users that quality has suffered. Now, Stanley Black & Decker "has agreed to purchase the Craftsman brand from Sears Holdings for an initial payment of $525 million, an additional $250 million after three years, and annual payments based upon sales growth through non-Sears channels for the next 15 years. In addition to increasing retail distribution of the brand, Stanley Black & Decker predicts an expansion of domestic manufacturing in order to meet anticipated demand." This Craftsman flat-blade screwdriver with screw-holder claw measures five inches long overall. Purchased by me in the early 1970s, it's now a 'vintage' item, I guess. Trademarked by Sears in 1927, the Craftsman brand remained an exclusive of the Chicago retailer for decades, but today can be purchased at Kmart (technically, the owner of Sears under Sears Holdings), Ace Hardware, U.S. military exchange stores, Grainger, Orchard Supply Hardware, and other outlets. Old Measuring Devices: Over at Hemmings, Tom De Mauro recently blogged about a Starrett dial indicator found at a flea market. I have a similar gauge made by B.C. Ames of Waltham, Massachusetts, which we always referred to as a snap gage. 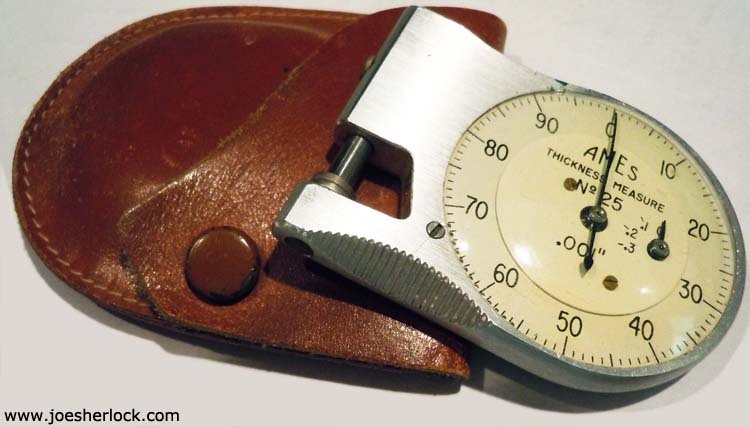 I was given the device when I worked at Uniroyal in 1965-66 to measure the thickness of rubber sheeting. At Rohm & Haas and, later, Discovery Plastics, I used it to check the thickness of acrylic sheets. It could handle thicknesses of up to 0.312 inch thick material. Ames still sells my No. 25 pocket thickness device. My snap gauge is over 50 years old and works like a charm. Now that's quality! My Life At The Plastics Lab: Recently, I came across some old photos and other materials which brought back fond memories from the early part of my post-college career. The photo was published in a Rohm & Haas Co. employee newsletter. This was a good time in my career. I really enjoyed working at R&H - the pay was very good, the fringe benefits were excellent and the working conditions were many times better than my previous employer: I had been employed at the Uniroyal Timing and V-Belt Plant in Northeast Philadelphia for about a year after I graduated from college. Rohm and Haas always offered customer support for its plastics materials but, in 1964, the company opened a new Plastics Engineering Laboratory (PEL) at its Bristol, Pennsylvania site. Customers seeking advice on problems relating to Plexiglas & Kydex sheet and Plexiglas and Implex molding powder were directed the PEL for help. Nothing Beats A Good Screw: When I attach the fabricated steel semi-circular rockers to my wood train platform, I use eight #12 stainless steel, 1.25-inch long pan head, Phillips sheet-metal screws. Sheet metal screws seem better at handling misaligned pieces and have a deeper thread for better holding power compared with conventional tapered wood screws. I like stainless because it's a little stronger than regular steel and doesn't corrode. A continuing problem with the platform is that I tend to strip out the Phillips head after a couple of uses, because I'm too enthusiastic/impatient when I wield my Makita power drill/screwdriver. I've been buying new screws as I needed them but decided to bite the bullet and get a box of them. Now I won't need to purchase more until at least 2037. Maid To Last: Founded in 1920 in Wooster, Ohio and initially named Wooster Rubber Co., Rubbermaid quickly expanded from toy balloons into housewares and automotive accessories. In 1956, the firm began producing injection-molded plastics items as well. Ohio soon became a hotbed of plastics activity. In the 1980s, it was the Number 2 state ranked by plastics activity. California held first place. When I worked at Rohm and Haas' plastics lab, everyone marveled at the quality of Rubbermaid's molded goods. The products were carefully designed, knockouts and splitlines were located with obvious forethought and the resultant parts were well-trimmed defect-free and unwarped. 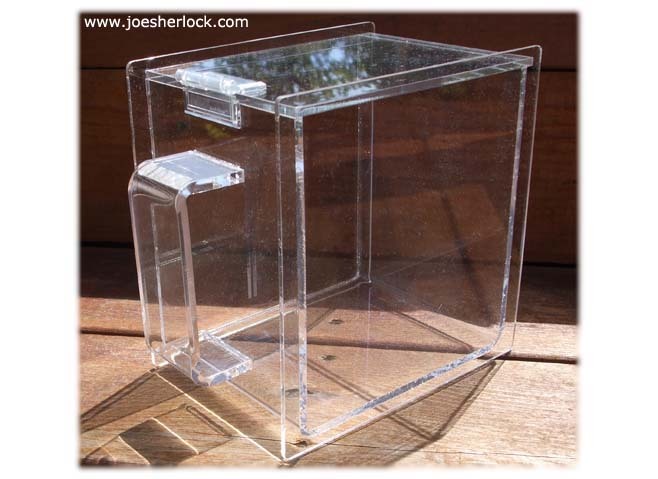 I once remarked to a plastics colleague as we examined the clever gate location on a particular Rubbermaid item, "These seemingly simple parts have a certain technical elegance about them. The design is well carried out." We have a 20 year-old Rubbermaid Bruiser trash can that still looks and performs like new. Its wheels roll freely and the can is free of dents and cracks. 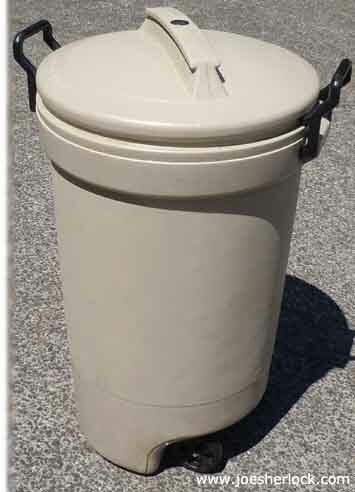 I remember the old galvanized trash cans which Philadelphia trash collectors gleefully pounded until they became useless, ugly lumps of ruined metal. It usually took five years destroy them. We've owned non-Rubbermaid plastic trash cans which have faded and cracked with time. Every Rubbermaid product we've ever purchased has been of high-quality and free of design or manufacturing flaws - surprising considering that most plastic housewares are made to a price and full of compromises. After years of selling its wares through a broad base of retailers and growing to fill a 1.3 million square-foot facility in Wooster, Rubbermaid got in trouble by becoming too dependent on Wal-Mart and went broke in 1999. Newell Manufacturing Company started in 1903 as a maker of curtain rods and diversified by acquiring Bernzomatic propane torches, Mirro, WearEver and Rema cookware, Anchor Hocking glassware, Rolodex filing systems and Dymo labelmakers. Rubbermaid was rescued when Newell acquired it. Rubbermaid products continue to be produced in Huntersville, NC; Mogadore, OH; Greenville, TX; Vista, CA; Winfield, KS; Jackson, MO; Mississauga and Calgary, Canada and Tultitlan, Mexico. More than two-thirds of Rubbermaid's sales still come from the United States. The Hardware & Fastener Museum: Like many other guys my age, I have enough assorted screws, bolts, nuts, washers, etc. in various jars, cans and Zip-Loc bags to last me for the rest of my life. And my children's lives too. Last week, I bent a small wood screw. I went to my museum in the garage, grabbed a couple of appropriate jars, brought 'em inside and dumped the contents on newspaper. Rooted around until I found a match. Then I veed-up the paper and poured everything back into the jars. It took me about 20 minutes - less time that it would take to drive to town and back. No gas, nothing to buy and no sales tax to be paid. Recycle, reuse - why I'm greener than a dead Al Gore floating face down in an algae farm. And my museum still looks full - the purloined wood screw will not be missed by future museum visitors. Once in a while, I find a bolt or nut in my driveway. I feel compelled to save it just in case it fell off one of our cars. More than likely it came off the frame of a UPS delivery truck. Or fell from a 747. I have Mystery Driveway Fasteners dating back to the 1960s in my museum. Some of the earlier ones might have come from a DC-6 or Lockheed Electra. Or maybe Carmen Electra. I also tend to save shipping fasteners from appliances and other large items. You never know when you might need them for "something." Simple & Clever: I've owned a General Tools #68 wire stripper since the 1960s. It does its job well and the design is a uncomplicated yet ingenious. It was unique enough to warrant a patent, issued in 1956 to Ermon F. Ayer, founder of High Precision Inc., a Connecticut contract manufacturer. His company apparently produced this item for General Tools, a NYC firm which offered specialty tool items, including circle cutters, metal punches and pocket screwdrivers. General Tools still sells wire strippers and is owned by relatives of the 1920s founders. Ermon F. Ayer's descendants still operate High Precision at the orginal original site in Hamden, CT. In an age when U.S. manufacturing and distribution is in decline, it's nice to see a couple of firms which have not only weathered the storm but have not been swallowed up by some faceless conglomerate. Cheap Screwing: When I was working on my train layout last month, I pulled out an old thin-bladed screwdriver to do some pry work. I realized that I had purchased it in 1962 or '63 at a neighborhood hardware store. The place kept a white paper bucket near the cash register full of screwdrivers for sale at 9¢ each. The black rubberized handle is imprinted with 'VINYL RIP USA'. I'm not sure if the manufacturer was RIP USA or what. The blade is pretty beat up from years of misuse, including haphazard and thoughtless chisel work but the screwdriver is still in one piece. As I grew older and had more money, I bought better tools but, hey, ya gotta start somewhere. Big Dig: Caterpillar is buying mining equipment giant Bucyrus International for $7.6 billion. Caterpillar, the world's largest construction and mining equipment maker, wants to capitalize on growing equipment demand in emerging markets, China, India and Brazil, which need such materials to feed surging economies. Bucyrus makes surface mining equipment used for mining coal, copper, iron ore, oil sands and other minerals. Demand for commodities has languished in traditional markets, pushing global companies like Caterpillar Inc. further into China, India and Brazil, which need such materials to feed surging economies. If as a kid, you ever drooled over big construction equipment, you knew Bucyrus or the monstrous giants it made - some of the biggest shovels and draggers in the world. You know, the ones where they park a pickup truck next to it and Bucyrus makes the truck look like a little Tonka toy. The Bucyrus Foundry and Manufacturing Company was founded in 1880. The firm was an early producer of steam shovels. In 1904, Bucyrus supplied 77 of the 102 steam shovels used to dig the Panama Canal. The business became Bucyrus-Erie in 1927 with its merger with the Erie Steam Shovel Company, then the country's leading manufacturer of small excavators. The Big Muskie walking dragline was built in 1969, with a 220-cubic-yard bucket and weighed 14,400 tons. Two 3850-B stripping shovels built in 1962 and 1964, with bucket capacities of 115 and 145 cu. yds., respectively. Support America; Buy Pliers From This Guy: Channellock is an old-line 124 year-old Pennsylvania firm which makes hand tools, including its famous namesake pliers. Channellocks are the best; I've used them for almost 50 years. The company produces all its tools in America and employs over 400. Company president William S. Dearmint has no time for ObamaNonsense and the Gang in Washington: "I recently wrote about the ongoing lack of leadership in our country. ... We continue to be driven by unknowing, no "skin-in-the-game," income-redistributing, progressive-spendthrift members of Congress and White House staff. They have no respect for the private sector, for manufacturing or for our country. ... We need a manufacturing-sector program to make U.S. manufacturers more competitive on a global basis. The Obama Administration doesn't even consider this." I couldn't agree more. Manufacturing is vital to the economy of the United States because it is a generator of wealth. Taking low-cost raw materials (wood, baking flour, steel) and processing them to produce much more expensive items (furniture, cakes, automobiles) creates profit. This in turn produces prosperity - for individuals and for a nation. Furthermore, if the nation's products are unique and interesting enough that people in other countries want to buy them, fresh capital is brought into the United States. Such capital can used to expand capacity, improve product offerings and increase efficiency - these things make our wares even more competitive and attractive in the world market. • Tort reform: The litigious atmosphere in the U.S. puts manufacturers at a competitive disadvantage with the rest of the world and tempts businesses to make or buy in other countries where costs are lower. Product liability insurance costs, health care costs (premiums are high due to malpractice insurance and litigation) and general liability costs are a crippling burden on manufacturers. Manufacturers have become outsized targets, as plaintiffs' lawyers consider operating companies' "deep pockets" of insurance and capital. • Silly, thoughtless state and federal mandates should be rescinded. OSHA personnel should focus on truly dangerous situations, not harassing small manufacturers by counting up blankets and salt pills. • The U.S. Small Business Administration should be revamped, eliminating useless programs and doing better things with your tax dollars - like encouraging value-added business development. • We should copy the Chinese and Japanese, doing everything possible to keep the dollar low in value relative to other currencies, so that our exports are attractive and imports less so. In other words, filling a diaper is not a reason to proclaim: "Look, I just made something." Then Mr. Sullivan discussed Norm, late of the TV show, 'The New Yankee Workshop': "Norm Abram is the penultimate example of true "Reality TV." He made real things, and encouraged others to do so. No pretense. Not a scam. The balloon boy's father will get his 15 minutes, but being part of Katie Couric's nightly geeks and freaks sideshow act is a virtual reality, not real real. He'll get a book deal or an ankle bracelet or both, but he literally contributes nothing to the sum total of world's worth." Norm created real objects from scratch. Or repaired them. Or modified them. Or saved them from the Great Trash Heap. There is a great satisfaction in that. I didn't learn proper woodworking until I was in my late 30s. My aunt had a mahogany drop-front secretary desk-bookcase, topped with a carved crown Chippendale-style bonnet. At age 25, I ended up with it. As was the style at the time (1968), I threw away the crown (deemed 'too fussy' by me) and slathered some hideous green antiquing stain-glop over the tired and marred finish. By the early 1980s, I became sufficiently ashamed and embarrassed over my sacrilegious act that I set out to restore what remained of the piece. I stripped off the appalling green coating as well as many years of darkened varnish. I repaired and patched the underlying wood where necessary. I removed and refinished all the brass knobs, hinges and trim, replacing what was missing. I spent many evenings sanding and steel-wooling the solid wood surfaces until they were silk-smooth. Then I carefully applied stain, worked it in with OOOO steel wool and reapplied more stain, working that in - repeating the process until the depth of grain of this fine wood specimen could be fully appreciated. Afterwards, I gently breathed a coat of protective urethane varnish over it. Then it was time to reassemble and realign all pieces. As a final touch, I reglazed the doors with bronze-tinted transparent Plexiglas panels. I think my aunt would have liked the result. This piece of furniture, made in the mid-1930s, will outlive me. And, with a little TLC, my children too. Clever Design: I am always fascinated by simple, yet novel devices. I found one last week in my desk. The Champion circular taper gauge has a tapered-thickness edge spiral around its circumference. It shows inches (ranging from .020" to .100") on one side and millimeters on the other (0.6mm-2.4mm). The stainless steel piece is about the size of a silver dollar and incorporates a beveled round hole for opening electrode gaps. A design patent for this "ornamental design for a spark plug gapper" was issued to George G. Martin of Kent, Ohio in 1977. Tool Time: Recently, I read an article by Chris Vander Doelen in the Windsor Star about tool and diemakers. Excerpt: "An estimated $375 million owed for automotive tooling, dies and molds - most of it carried as debt by companies in the Windsor region - is at risk of default by the looming bankruptcies of General Motors and Chrysler. In yet another estimate of the impact a Detroit automotive bankruptcy would have on the economy, leaders of Ontario's MTDM (machine tool, die and mould) sector say they are owed for at least a quarter of their $1.5-billion output over the past year." This is shocking to me. For many years, tool and die firms were run by no-nonsense Germans. They were good at what they did and ran one of the last Cash On The Barrelhead industries in America. Terms were the same for everyone whether you were a young Joe Sherlock ordering an aluminum short-run injection mold or General Motors buying an Oldsmobile fender stamping die: 50% down with purchase order; balance COD. No exceptions. In Search Of Tinkerers: John Derbyshire has bemoaned the general loss of interest in creating and fixing stuff. "The other evening Bill O'Reilly had a segment on the old Cheers! sitcom of the 1980s. He brought in John Ratzenberger (Cheers' Cliff Clavin and host of 'Made In America') as a guest. As well as being an actor, John is founder of the Nuts, Bolts, and Thingamajigs Foundation, dedicated to raising awareness of skilled trades and engineering disciplines among young people." John says, "Skilled trades form the backbone of America!" Derbyshire continues: "To anyone under forty, a garage is a place to keep your car, and a basement is a rumpus room for the kids. Yet the U.S.A. sprang up out of garage and basement tinkerers, small workshops, teen boys fixing up their cars on a Saturday morning. Everything from the aeroplane to the personal computer started in someone's garage." "Take a walk down your street on a Saturday morning. See any young guys fixing up their cars? No, they're all indoors playing Grand Theft Auto and texting each other." He concludes, "If we give up tinkering, we might survive but only as a bureaucratic empire of paper-pushers and lotus-eaters." Shop class seems headed toward becoming a thing of the past, as educators prepare students to become "knowledge workers" - clerks and bureaucrats. Or diversity consultants. Or life coaches. Or community organizers. Unfinished Business: Jeremy Clarkson had railed against 'Some Assembly Required'. He recently purchased some outdoor lights - only to look inside the box and find that "there were some poor-quality instructions which explained that all you needed to assemble your quality product was fingers like cocktail sticks and six and a half thousand tools that you do not own. It was truly and genuinely extraordinary to find how little had been done at the factory. And this is not a one-off. These days we see exactly the same thing with furniture and all children's toys." "Of course, I commend any company that can maximize its profits and quench the thirst of its shareholders. This is all excellent and makes the world go round, but implying on the box that the customer is buying a garden heater when in fact he's buying a box of pieces: that's flirting with fraud." Good Trade: In 'Shop Class as Soulcraft', Dale Dougherty has noted that "Matthew B. Crawford writes in praise of manual labor, lamenting the disappearance of the shop class (and shop teachers) as our culture focuses on developing knowledge workers who supposedly use their heads, not their hands. He writes: "At the same time, an engineering culture has developed in recent years in which the object is to "hide the works," rendering the artifacts we use unintelligible to direct inspection." Don't believe it? Got to almost any auto showroom and pop the hood. What do you see? A Fisher-Price interpretation of an engine. Crawford wonders if a decline in the use of tools has made us "more passive and more dependent. And indeed, there are fewer occasions for the kind of spiritedness that is called forth when we take things in hand for ourselves, whether to fix them or to make them." He adds: "So perhaps the time is ripe for reconsideration of an ideal that has fallen out of favor: manual competence, and the stance it entails toward the built, material world." I mourn the decline of 'learning a trade'. It is something you can fall always back on during the next down cycle when your MBA is worthless. Sure, you won't be able to afford your 7-Series, but you can make a pretty darned good living as a skilled electrician. Or cabinetmaker. Or drywaller. It pays better than driving a cab. Or welfare. Planned Obsolescence: Doug Flint has explained why so many of the tools in my various tool boxes are now useless. Excerpt: "My guess is that somewhere around 1965 every nut, bolt, and fastening device that would ever be needed to assemble a car had been invented and perfected: The six-point (hex) bolt. The twelve-point bolt in either fine or coarse thread in a variety of strengths and numbers that could cover virtually every application, including where spatial limitations prevented the use of a conventional wrench or socket. The good old Allen-head bolt (an internal six-point) such as the type that served my '79 Triumph Bonneville motorcycle and all the Ikea furniture I ever bought. Unfortunately the inventing didn't stop there, but for good reason. Can you picture the scenario? Chief of 500-man Fastening Devices department talking to head of company: "Sir, I believe we have invented every fastening device you will ever need." Some Assembly Required: Northwest Airlines has filed for bankruptcy protection and wants to lay off two-thirds of its mechanics. The boys at West Coast Customs had their way with a plump '76 AMC Pacer. Alex (The Wheel and Tire Guy) was fabricating Plexiglas bins and remarked, "I flame polish the edge, so - when I glue it - it sticks better." This is very bad advice. To get a strong, break-resistant glue joint, you glue it before you polish. Flame polishing should be done only after the glue has thoroughly dried to prevent bubbling. And flame polishing should be done with a light touch to prevent crazing of the acrylic later on. Making It Stick: I use epoxy for lots of repair jobs. But epoxy is a rigid adhesive and doesn't always lend itself to flexible items or dissimilar materials exposed to temperature cycling. For those applications, I used to use Hob-E-Tak - available at most hobby shops. It was sticky, smelly and flexible; it cured in less than an hour.